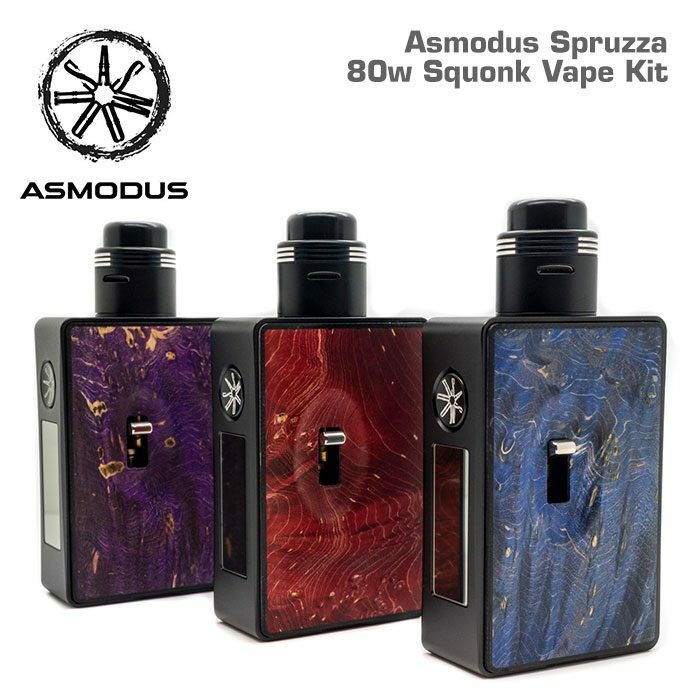 The Asmodus Spruzza 80w Squonk Vape Kit features the Fonte RDA and the Spruzza regulated mod made of aluminium and stabilised wood and featuring the 6ml Smart Siphon System. 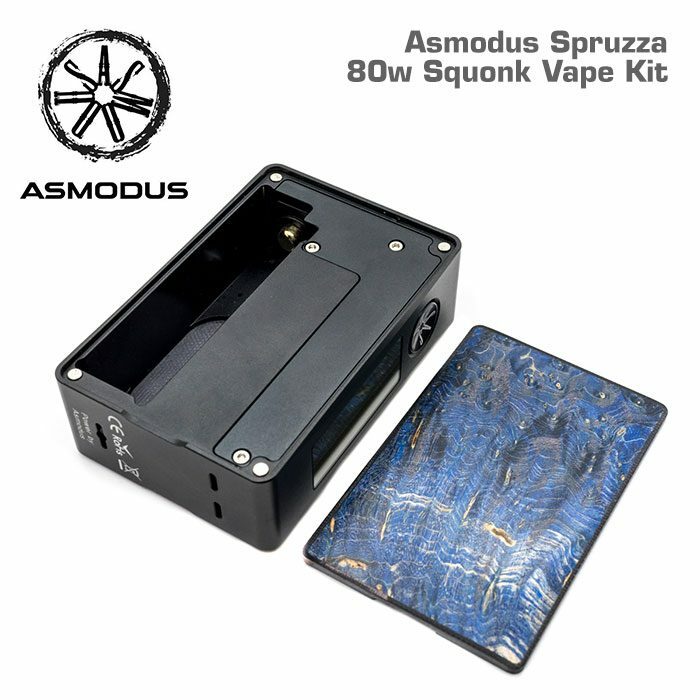 Powered by a single high-drain 18650 Li-ion battery (not included but available HERE), the Spruzza is designed from the ground up to be the perfect daily driver bottom feed device, combining exceptional performance with a compact form factor and reliable squonking mechanism. 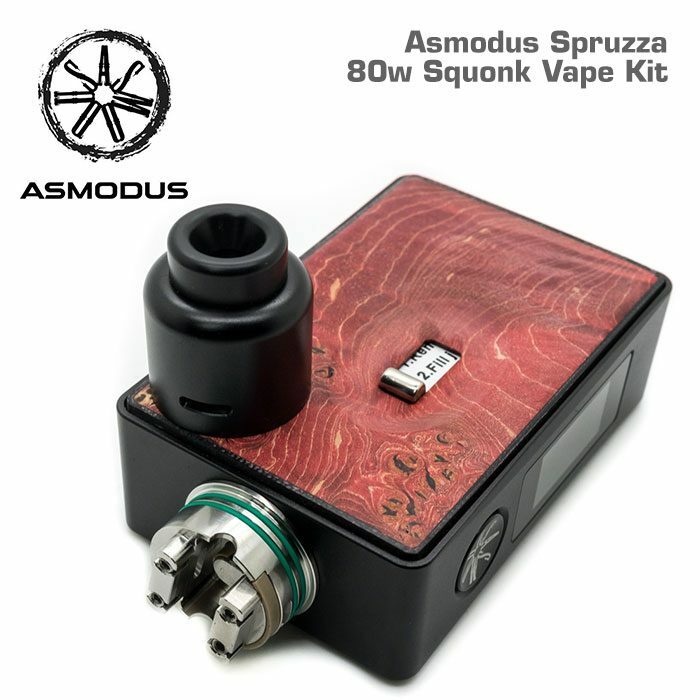 The Spruzza was created with the user in mind, it is a combination of every feature you could want in a bottom feed device, with a few that Asmodus spent countless nights at the drawing board perfecting. 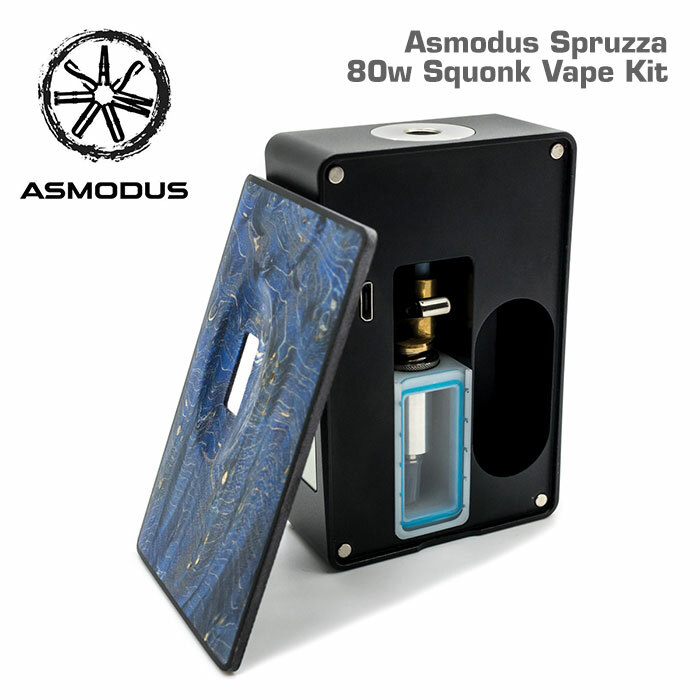 The exterior of the Spruzza is composed of a solid aluminum chassis framed with our renowned stabilized wood in the form of two removable 1.5mm side panels, but the real star of the show is our proprietary Smart Siphon System (SSS), a pump system that is the first of its kind. Both simple to maintain and operate; the SSS can be easily removed for cleaning and replacement, and can hold up to 6ml of your favourite juice in the reservoir, which can be filled by sliding the glass door upwards. Designed with simplicity in mind, the SSS provides the perfect amount of juice to replenish your wicks with every push of the lever, and is infinitely more durable than the silicone bottles used in other squonker mods due to the polymer construction. 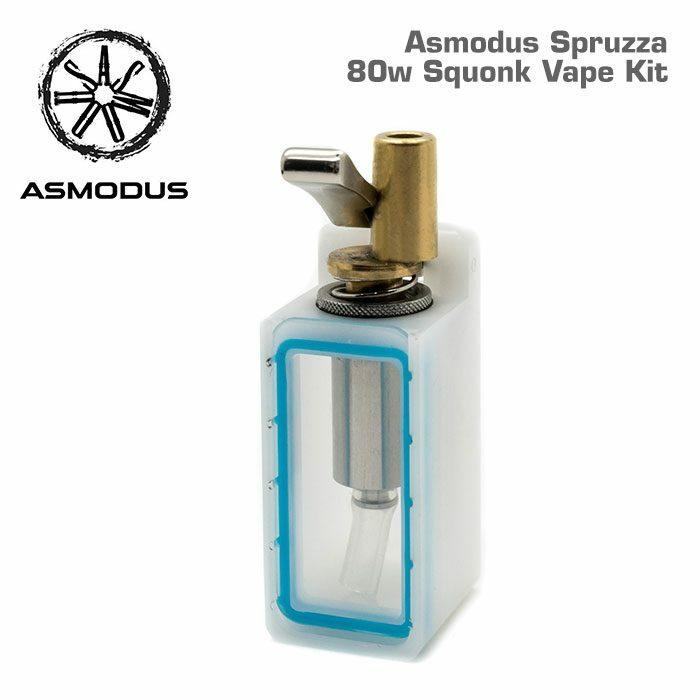 The Spruzza is Asmodus’s take on the ideal squonking device and an exercise in perfection. The brand-new GX-80-HUT chipset builds on the innovation of the SSS, allowing the user to switch between straight wattage, wattage curve, and temperature control modes with a simple swipe of the finger, making adjusting the experience provided by your device faster and simpler than ever. Curve allows the user to imitate the experience of temperature control mode by allowing the user to set 5 different wattage settings combined with 5 time presets up to a maximum of 10 seconds. 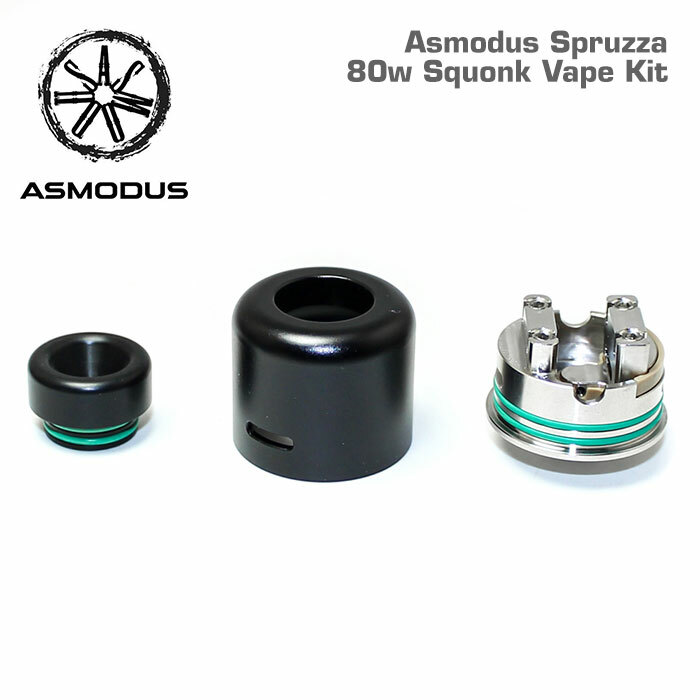 For example if you were running a Clapton style coil, which typically require a little ramping to get to a firing sweet spot, you can set the device to fire at 80 watts for 0.2 seconds and then 65 watts for 5 seconds. To cycle through the firing modes, all you have to do is unlock the screen and swipe the mode symbol at the top to the left or the right. To switch between the different presets for temperature control, just press and hold the TEMP symbol. Adjusting what wattage or temperature the Spruzza fires at can be done by tapping the number located in the middle of the display, and to set your curve, press and hold. Included with each Spruzza squonk mod is the new Fonte RDA, which is focused on flavour. The deck of the Fonte is a simple two post design with side-mounted screws, making it easy to build on, and the juice well has a convex shape that makes juice flow to the walls, where it will be absorbed by your wicks. The side airflow inlets have been machined at a downward angle to simulate a bottom-airflow design for improved flavour, which is enhanced by the conical top cap and wide-bore drip tip. 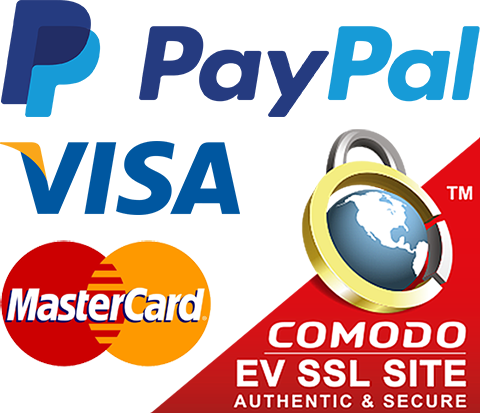 Please note: The SSS (Smart Siphon System) was not intended to be taken apart for cleaning. DO NOT attempt to take the SSS apart.